Rising incidence of ligament injuries across multiple body parts such as shoulders, spine, wrists, knees, and feet will propel the adoption of ligament stabilizers. Leading manufacturers of medical devices are expected to increase their presence in the global production of ligament stabilizers. To meet the growing demands, companies namely, Össur hf, DJO Global Inc., Bauerfeind AG, Breg, Inc., BSN Medical GmbH, DeRoyal Industries, Inc., Otto Bock Healthcare GmbH, 3M Company, medi GmbH & Co. KG, and THUASNE SA are expected to lead the production of ligament stabilizers in the years ahead. 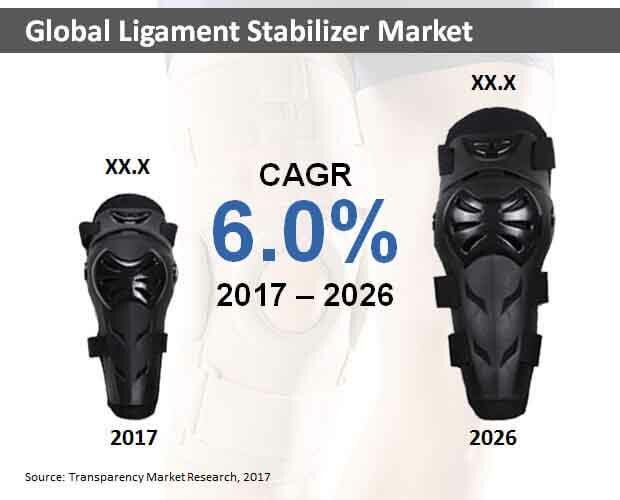 Transparency Market Research’s latest forecast study has assessed these companies as leading players in the global ligament stabilizer market. The study foresees a robust growth in demand for ligament stabilizers for the assessment period, 2017-2026. During this period, the global ligament stabilizer market is pegged to expand at an estimated 6% CAGR. The report also forecasts that by the end of 2026, ligament stabilizers worth over US$ 3.5 Bn will be sold across the globe. Majority of ligament stabilizer products being adopted in the global healthcare industry are observed to knee braces & supports. The effectiveness of these braces and supports during the reconstruction of cruciate ligaments will continue to instrument their growing adoption. By the end of 2026, nearly 40% of the overall market revenues will be accounted by global sales of knee braces & supports. The report also assess a steady demand for foot and ankle braces & supports. In 2017, foot and ankle braces & supports worth around half a billion dollars have been sold in the global ligament stabilizer market. In terms of sales, hospital pharmacies are poised to bring in around US$ 1.5 Bn in global revenues by the end of 2026. The report also reveals that ligament stabilizer products will be rapidly sold through retail pharmacies in the foreseeable future. High incidence of mild ligament injuries will also influence the sales of ligament stabilizer products. The report projects that ligament stabilizers used for treatment of grade 1 injuries will account for the highest share of global revenues throughout the forecast period. In 2017, grade 1 injuries accounted for global adoption of ligament stabilizers worth more than US$ 1 Bn. Incidence of multiple knee injuries is relatively high in the US and Canada. Proactive lifestyles, active participation in outdoor activities & sports events, and the contrasting rise in disregard for personal physical fitness has collectively spurred the incidence of ligament injuries in the US. Manufacturing of ligament stabilizers in North America remains quality-oriented, and several domestic players are incurring lucrative gains from rising exports. The study projects that by the end of 2026, North America’s ligament stabilizer market will surpass US$ 1 Bn valuation. Europe and the Asia-Pacific excluding Japan (APEJ) region are also observed as lucrative for expansion of the global ligament stabilizer market. While Europe will showcase second-highest adoption of ligament stabilizer, APEJ countries will instrument the global ligament stabilizer production through 2026. A long-term outlook on the future of global ligament stabilizer market, proposed by the study, remains positive with advancements in product development and an upsurge in post-surgical applications.